Reading comprehension draws on a broad range of skills and habits. Background knowledge and a deep vocabulary are two of the most critical ingredients in becoming a good reader. One of the most important ongoing jobs for every teacher is to help students make progress every day in expanding their knowledge and increasing their vocabulary. Here are some ways that teachers can help students improve their reading comprehension. This is the language used in books and in teachers’ explanations and instructions that many students will be unfamiliar with. Academic language is more formal than the social language students use in speaking with their friends. It typically involves domain-specific vocabulary and words that are richer and more abstract than the words we use in everyday social speech. To help students with academic language, teachers should explain words that K-3 students might not know, such as “character,” “setting,” “plot,” “even numbers,” “between,” “among,” and “compare.” Teachers should also review topic-specific vocabulary terms shortly before a formal lesson begins. Students should become familiar with these new terms before the content is taught. Students need to become aware of word order within a sentence whether it is simple or complex. A good reader is able to “repair” meaning within a sentence by understanding the word order of the sentence. Some sentences are more difficult than others to understand. As texts become more complex, students will increasingly encounter challenging vocabulary words, compound or complex sentences, and complex syntax (i.e., sentences that may include a passive voice, double negatives, a range of verb tenses, prepositional phrases, or unconventional word order). A child who is reading a syntactically complex sentence such as The cat that jumped up on the counter and that tried to grab the bird later disappeared under the sofa may misunderstand which animal disappeared (the cat, not the bird). It is important for teachers to be able to scaffold instruction for these kinds of sentences. For example, the teacher can ask the child to find the subject of the sentence (“what the sentence is about,” i.e., the cat) and then ask what the main “doing” word or “being” word is in the sentence (i.e., disappeared), pointing out that the entire phrase “that jumped up on the counter and that tried to grab the bird” describes or “goes with” the cat. Some words and phrases are especially important because they signal certain relationships among the ideas in a text. For instance, phrases such as “in summary” or “to sum up” signal that ideas previously explained in a text are being summarized. Words such as “first,” “second,” and “third” signal a sequence of events or ideas. Words such as “therefore” and “accordingly” signal that one idea or development is building on a point that has just been made. Words and phrases such as “in contrast,” “however,” and “nevertheless” signal an opposite point or a counter-example to a previous point or idea. Students with comprehension difficulties may not understand or may fail to pay attention to these kinds of words, and explicitly teaching them to do so may be helpful. Another common difficulty in comprehension involves keeping track of “anaphoric references” that refer back to other words in a text — words such as pronoun referents (he, she, it, they). A long story requires children to keep track of many anaphoric references, and if children cannot remember who “she” or “he” refers to in a particular sentence, comprehension will be impaired. Frequent questioning during reading to make sure that children are keeping track of these references can be helpful. Children with more significant difficulties in this area may be helped by visual aids such as color-coding pronouns that refer to a particular character. Graphic organizers can enable students to identify all of those elements as they are reading and help them understand what they are reading. You can find some good story maps here. While narrative text tells a story, generally the main purpose of expository text is to convey information. Expository text often progresses from general information to specific information by making an assertion and then providing supporting details. Expository text often includes specialized concepts and vocabulary reflecting the topic at hand. For example, a book about astronomy might include terms such as “planets,” “comets,” “meteors,” “light years,” and “galaxies” that would not usually appear in narrative texts. By paying attention to these structural elements of expository text, students can more readily understand what they’re reading and follow the course of an author’s argument. As students become more aware of these devices, they can use them as they re-tell or summarize a text, both verbally and in writing. Drawing inferences is a complex skill, but it’s an indispensable part of reading comprehension. Inferring involves “reading between the lines” to understand what the author really means to convey. An inference is an idea or conclusion that’s drawn from evidence or reasoning — an educated guess. Students need to learn over time to pay attention to what the author says and to the tone of the passage, put information in context, pull together clues from different parts of the text, and draw on their own background knowledge. Drawing inferences is a critical skill that students can develop over time with a lot of guidance and a lot of practice. Helping students see, day after day, when information is implied, rather than directly stated, will improve their skill in drawing conclusions and making inferences. These skills will be needed for all sorts of school assignments, including reading, science and social studies. You can teach the understanding of text by modeling how to read between the lines of a passage. Teachers can begin by reviewing with the students what the text says explicitly, and then starting a discussion about what the author meant, or what the characters might have been thinking or feeling, or what a specific incident might reveal about the bigger picture. It is also important to try to determine the reasons that underlie a particular student’s inferencing problems. Consider a sentence such as this: Joseph was frightened when he saw the funnel cloud approaching in the distance. A student who lacks background knowledge about tornados and the fact that they have a funnel shape will probably be unable to answer an inferential question about this sentence such as “Why was Joseph frightened?” Lack of background knowledge is the true culprit here, not a general inability to make inferences. As another example, children with autism tend to have impairments in perspective-taking, the ability to take the perspective of others, including characters in a book. These children may have considerable difficulty drawing inferences about characters’ motivations and feelings, because of their problems with perspective-taking. The elements that are most important for good reading comprehension — such as background knowledge, vocabulary, and the ability to think critically — are deep skills that are learned and developed day-by-day over many years. These skills are essential in enabling students to engage in close reading and deep, thoughtful reading comprehension. Comprehension can also be boosted for many students through a set of specific strategies. Comprehension strategies are conscious plans — steps that many good readers use to make sense of text. Comprehension strategies can help students become purposeful, active readers who are in control of their own reading comprehension. Teaching these strategies appears to be most helpful once children have mastered basic decoding skills and have at least a basic level of fluency. Students who are good at monitoring their comprehension are aware, as they read, of whether they understand what they are reading. They have strategies to "fix" problems in their understanding as the problems arise. Research shows that instruction, even in the early grades, can help students become better at monitoring their comprehension. Before reading, good readers often clarify their purpose for reading and preview the text. During reading, they might monitor their understanding, adjusting their reading speed to fit the difficulty of the text and "fixing" any comprehension problems they have. After reading, they check their understanding of what they read. Look forward in the text for information that might help them to resolve the difficulty. ("The text says, 'The groundwater may form a stream or pond or create a wetland. People can also bring groundwater to the surface.' Hmm, I don't understand how people can do that. … Oh, the next section is called 'Wells.' I'll read this section to see if it tells how they do it."). Graphic organizers illustrate concepts and relationships between concepts in a text. Graphic organizers are known by different names, such as maps, webs, graphs, charts, frames, or clusters. Here are some examples of graphic organizers. Click on the titles to download printable versions of each organizer. Venn-Diagrams: Used to compare or contrast information from two sources. For example, comparing two Dr. Seuss books. Storyboard/Chain of Events: Used to order or sequence events within a text. For example, listing the steps for brushing your teeth. Story Map: Used to chart the story structure. These can be organized into fiction and nonfiction text structures. For example, defining characters, setting, events, problem, resolution in a fiction story; however in a nonfiction story, main idea and details would be identified. Cause/Effect: Used to illustrate the cause and effects told within a text. For example, staying in the sun too long may lead to a painful sunburn. For more free graphic organizers, visit the Balanced Reading website. The Question-Answer Relationship strategy (QAR) encourages students to learn how to answer questions better. Students are asked to indicate whether the information they used to answer questions about the text was explicit information (information that was directly stated in the text), implicit information (information that was implied in the text), or information entirely from the student's own background knowledge. Right There: Questions that ask students to find the one right answer located in the text in one place as a word or a sentence in the passage. Example: Who is Frog's friend? Think and Search: Questions based on the recall of facts that can be found directly in the text. Answers are typically found in more than one place, thus requiring students to "think" and "search" through the passage to find the answer. Example: Why was Frog sad? Answer: His friend was leaving. Author and You: Questions require students to use what they already know, as well as what they have learned from reading the text. Students must understand the text and relate it to their prior knowledge before answering the question. Example: How do you think Frog felt when he found Toad? Answer: I think that Frog felt happy because he had not seen Toad in a long time. I feel happy when I get to see my friend who lives far away. On Your Own: Questions are answered based on a students’ prior knowledge and experiences. Reading the text may not be helpful to them when answering this type of question. Example: How would you feel if your best friend moved away? Answer: I would feel very sad if my best friend moved away because I would miss her. By generating questions themselves, students become aware of whether they can answer the questions and if they understand what they are reading. Students learn to ask questions that require them to combine information from different segments of text. For example, students can be taught to ask main idea questions that will help them step back from the details and consider the overarching theme or idea of the text. As students become more sophisticated, they can gradually learn to ask themselves and others a broad range of questions about a text. Bloom’s Taxonomy of questions, developed originally by educational psychologist Benjamin Bloom, identifies six different types of questions ranging from basic “remembering” questions (e.g., “What happened?” “Where did this take place?” “Who was …”) all the way up to sophisticated evaluation and analysis. You can find sample questions and a wealth of ideas for actively engaging students with what they read here: Bloom’s Taxonomy Questions. KWL Strategy (Ogle, 1986, 1989) has students complete a three column template: what I know, what I want to know, and what I learned. In the “what I want to know” stage, students write specific questions that they think may be answered in the text. Questioning the Author (Beck, McKeown, Hamilton and Kucan, 1997) teaches students to engage actively with text by generating questions for the author. This helps students think more deeply about the text and the author’s purpose and point of view. In story structure instruction, students learn to identify the categories of content (characters, setting, events, problem, resolution). Often, students learn to recognize story structure through the use of story maps, which can help them track a story as they’re reading it and understand it afterward. 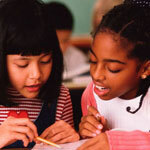 Cooperative learning involves students working together as partners or in small groups on clearly defined tasks. Cooperative learning instruction has been used successfully to teach comprehension strategies. Teachers should model the comprehension strategies so that students can learn to apply them as they work with each other. Teachers also help the students learn to work in groups. Then students work together to understand texts, helping each other learn and using the strategies that the teacher has modeled. Has research identified comprehension strategies other than the seven described here? The seven strategies described above have received the strongest research support. The two strategies below have also received some support from research. You may want to consider them for use in your classroom. Making use of prior knowledge: Good readers draw on prior knowledge and experience to help them understand what they are reading. You can help your students make use of their prior knowledge to improve their comprehension. Before your students read, preview the text with them. As part of previewing, ask the students what they already know about the content of the selection (for example, the topic, the concept, or the time period). Ask them what they know about the author and what text structure he or she is likely to use. Discuss the important vocabulary used in the text. If possible, you can also show students some pictures or diagrams to prepare them for what they are about to read. Using mental imagery: Good readers often form mental pictures, or images, as they read. In general, students (especially younger students) who picture a story during reading understand and remember what they read better than students who do not create a picture in their mind. Help your students learn to form mental images of what they are reading. For example, urge them to picture a setting, character, or event described in the text. Catts, H.W., Adlof, S.M., &Weismer, S.E. (2006). Language deficits in poor comprehenders: A case for the simple view of reading. Journal of Speech, Language, and Hearing Research, 49(2), 278-293. Clarke, P. J., Snowling, M. J., Truelove, E. & Hulme, C. (2010).Ameliorating children’s reading-comprehension difficulties: A randomized controlled trial. Psychological Science, 21, 1106-1116. Snow, Catherine E. Rand Report on Reading for Understanding (2002). Spear-Swerling, L. (2015). The power of RTI and reading profiles: A blueprint for solving reading problems. Baltimore, MD: Brookes. Willingham, Daniel. The Usefulness of Brief Instruction in Reading Comprehension Strategies. American Educator, Winter 2006/07.